How to import m4p music to Windows Movie Maker? If you meet the same problem too, You got the right place! Please read this simple guide to learn how to convert the protected M4P files to unprotected MP3 files then you can import the purchased music files into your Windows Movie Maker project. The M4P music files you purchased from iTunes store is protected by DRM, they could not be played without iTunes, iPod, iPhone etc Apple's product. So you could NOT import the music files into your Windows Movie Maker. You need some software to convert the protected M4P music file to unprotected MP3, WAV etc first, then you can import the mp3 files into Windows Movie Maker as background music. 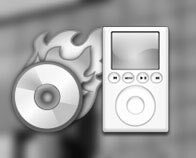 TuneClone uses a virtual CD burning technology to simulate the burning and ripping process and can convert M4P files to MP3 without any CD-R disc and do this work quickly. TuneClone installs a virtual CD-RW, it helps you burn any unprotected or DRM protected M4P, M4a, WMA music files onto the virtual CD, rips tracks on the virtual CD, encodes tracks onto MP3, WAV or WMA music files. It can repeat this audio converting procedure until your whole music collection is done. Windows Movie Maker is video creating/editing software that is included in recent versions of Microsoft Windows. It contains features such as effects, transitions, titles/credits, audio track, timeline narration, and Auto Movie. New effects and transitions can be made and existing ones can be modified using XML code. Windows Movie Maker was introduced in 2000 with Windows Me, but suffered from poor reviews due to its modest feature set in comparison with the year-old iMovie product on the Apple Macintosh. Version 1.1 was included in Windows XP a year later, and included support for creating DV AVI and WMV 8 files, but cannot be used with Windows Me. Version 2.0 was released as a free update in November 2002, and added a number of new features. Version 2.1, a minor update, is included in Windows XP Service Pack 2. Windows XP Media Center Edition 2005 introduced a new version of Windows Movie Maker, 2.5, with more transitions and support for DVD burning. A WPF version was included in some builds of Windows "Longhorn" (now Windows Vista), but was removed in the development reset.